This article is in need of an update. Editors are encouraged to update and expand the article. Elzar's Fine Cuisine is one of the New New York restaurants of Earth's most famous chef, Elzar. 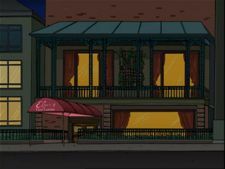 The restaurant is attended both by rich and influential customers (like the Robot Mafia or the Mayor's aide) and by fairly regular people - or, in the case of the Planet Express crew, who often visit the place to celebrate momentous occasions, fairly irregular people. The restaurant offers great Neptunian and Earthican food at ridiculous prices, and in most cases a reservation is needed to get in. Public health laws are not a major issue, but Elzar's art seldom lets the customer down. Many of the service personnel seem to be Neptunians]]. When Earth went into an economic depression in 3007, the restaurant served free Human Broth to those who needed it. Elzar: Enjoy our private dining room, folks. This is where we serve our richest, most successful chumps! That Guy: What have you got that's really overpriced? Elzar: Hey, there! How are you folks doing tonight? Bender: Great. What are the specials? Elzar: Well, let's see now. We've got a wonderful grizzly bear that's been dipped in cornmeal and lightly tormented. Questions? Amy: What was the bear's name? This page was last edited on 1 February 2015, at 18:05.